Craving Mediterranean flavors? 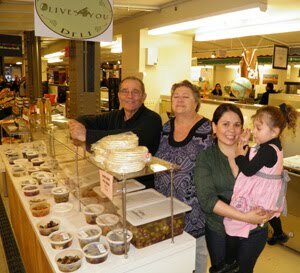 Western Mediterranean-influenced food arrives at Chicago French Market (131 N. Clinton St.; 312-575-0306) at MetraMarket in Chicago’s West Loop from its newest vendor, Olives 4 You. This proud newcomer to the Chicago French Market offers more than two dozen varieties of marinated and stuffed olives, hummus, tapenades and other fresh made spreads. Olives 4 You is a small family business that uses its distinctive southern French influences to enhance the shopping experience with their unique recipes. Owners Paula and Jean-Pierre Brocardi, along with their children Jean-Louis and Stephanie, work diligently at maintaining a traditional flair to create the purveyor’s assorted spreads, pita breads, olives, dressings, olive oils, and other ready-to-eat specialties. Olives 4 You also sells their specialties at seasonal markets throughout the Chicago suburbs and opened its first permanent location last year in Wheaton, Ill.
Olives 4 You joins an already impressive lineup of 30 vendors in Chicago French Market, a European-inspired market offering an array of local produce, meats, seafood, breads, pastries, cheese and wine, chocolates, pastas, artisan-made goods, flowers and a seating area for customers. Chicago French Market’s vendors stay open year-round, six days per week, and is located within the new MetraMarket development at 131 N. Clinton St. (between Washington and Randolph Streets). For more information, visit http://www.chicagofrenchmarket.com/.